Last week I took advantage of a free pass to Tacoma’s Museum of Glass downtown. There were exhibits of modern Irish glass, as artists came together to fill the hole left by the closing of the famous Waterford crystal factory, which along with the closing of three others had thrown hundreds of glass blowers and artists out of work. There were some other exhibits, but that was my favorite. The museum has a working hot shop, and hosts an ever changing schedule of artists in residence. There’s a gallery where you can come sit down and watch as the team works and the staff member narrates. I’ve visited it before, and I’m familiar with the basics. More because I was tired and wanted to get off my feet for a few minutes than any other reason, I decided to go in and watch for a few minutes. There was still time left on my parking meter, after all. What I found was the team working on something I’d never seen before. The artists of the day were two men at a table, painstakingly putting together a design they were copying off of an easel, and the leader directing the gaffers who went into the furnaces in turn with the work in progress. Here was the image that was transferred to glass. Click here to see the entire process. They had already formed the first shape by gathering and blowing it, and they had transferred the reproduction of a portrait onto that first graceful bulb. 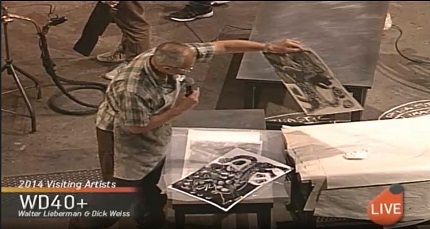 The artist explained, in answer to a question, that the picture was coded into a program that then printed it on a special type of resin, not in ink but in ceramic. Then that sheet was placed on the surface of the hot colored glass, smoothed, and sent into the furnace for a new, clear gather to encase it. 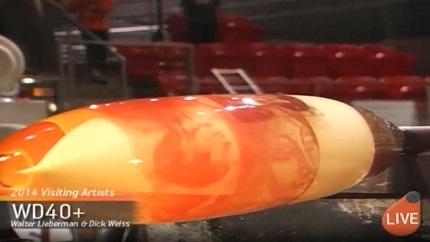 Look closely and you can see faces in the molten glass. I know from previous visits that they have to have materials with the same tolerances and expansion rates, or else the layers or colors will break as they’re set in the annealing oven to be gradually cooled. I could see a table below with other, finished examples of the technique, as I watched them insert the piece into the furnace, remove and blow, twirl and shape it with the paddles. The Savior enjoined his followers, both in Matthew and 3rd Nephi, to let their light so shine that others, seeing their good works, will glorify our Father which is in heaven. One of my favorite pieces in choir went, “The Lord bless you and keep you; the Lord make his face to shine upon you, and be gracious unto you. The Lord lift his countenance upon you, and give you peace,” from Numbers 6:24-26. Spiritual light can indeed shine upon us and from us. I watched as the team continued. It wasn’t enough to meld the portrait onto the surface of the honey-colored vase shape. It was returned, one step at a time, to the furnace for another layer of clear glass to seal it in, then another, and another. Each layer had to be formed then covered over, and at the end the bottom was pushed flat so that it could stand. The portrait showed through clearly, but now it was encased in luminous strength. What was that supposed to mean? What kind of answer was that? Find the man with a “Mormon face.” His delegator clarified: go down to the gate as that plane comes in, see who’s left after most of the people have been matched up, and approach the person who seems to have that light of the gospel in him, and ask if he’s so-and-so. So Brother Morehead went off dutifully but still uncertain, and blamed if it didn’t work, he said. It made him thoughtful, and he told us he mused on it often, that the spirit of the gospel should be visible in us. He told us that sometimes somebody doesn’t have that look, and sometimes someone might that isn’t a member of the Church (but that meant they might be prepared to find it), but most of the time it’s there. Last weekend our ward had a trip to the temple, all together on a chartered bus. The person who paid for the bus is known only to the bishopric, though some of us may have our suspicions. It was something that we used to do years ago, and it was wonderful to be all together. Some of us were doing endowments, and some were going to do baptisms; both had been arranged with the temple schedulers. A few of our members weren’t on the bus, but met us there because of logistics and work schedules. All but one are members of our current temple preparation class, and we were excited to have them go. We have encouraged them to go to the temple and do baptisms for the dead while they are waiting to take out their endowments, because it gives them an opportunity to be in the temple and feel the singular spirit there, and take part in the work. The ones who did baptisms, though they were scheduled to begin a half hour later than our session, were done far earlier than we were. We found them waiting outside as the bishop signaled the bus to come load us up to go home. Every one of them said that they had had a wonderful experience; we didn’t need to be told, because we could see their joy in the light of their faces. One sister who was there for the first time and walks with a cane told me that all her pain lifted from her as she walked in the temple doors, and didn’t touch her again until she walked out. She had a profound experience. Like the glass piece, the first shape of ourselves takes Christ’s image on top of it, but it isn’t done. It takes repeated experiences of service, prayer, faith, and covenant to build up that polished, clear layer of safety and strength. His light in us shines, the more we continue in His paths, and it will draw his other children in so that they may know Him too.